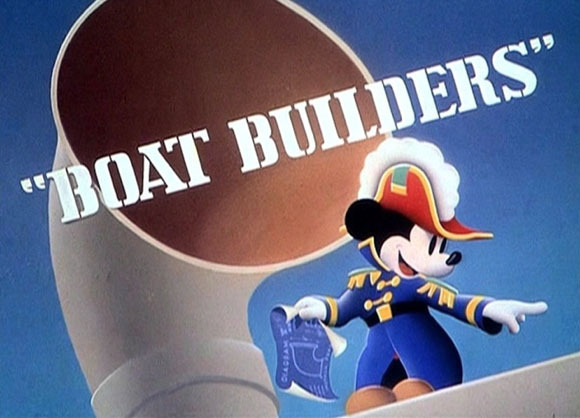 Disney’s “Boat Builders”: Even A Child Can Do It! The arrival of summer always makes me turn my sights to the water and sailing. It also reminds me of some of the wonderful boating themed cartoons made during the Golden Age of animation. 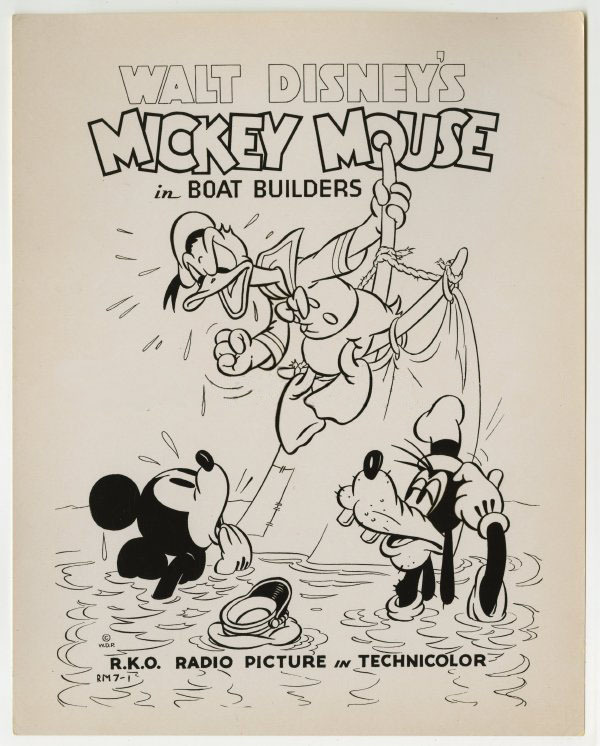 Most notably is Disney’s Boat Builders released in 1938 starring Mickey Mouse, Donald Duck and Goofy. This seven-and-half-minute short showcases the comical side of building a boat yourself from simple instructions that proclaim, “Build Your Own Boat, All You Do Is Put It Together.” With that statement, you already know from the outset that this boat building project will be anything but simple. The animation in these two opening scenes is by Louie Schmittt, who began working at Disney in 1932. Schmitt is one of the unsung heroes of animation. He worked at Disney for a decade mostly on shorts but also animated on Snow White and the Seven Dwarfs and Bambi. Schmitt left Disney after Bambi and eventually worked with the great Tex Avery at MGM on some wonderful and now classic shorts including Lucky Ducky (1948) and Bad Luck Blackie (1949) among many others. The scene dissolves to our trio beginning to open a large crate marked as the Keel and Ribs. 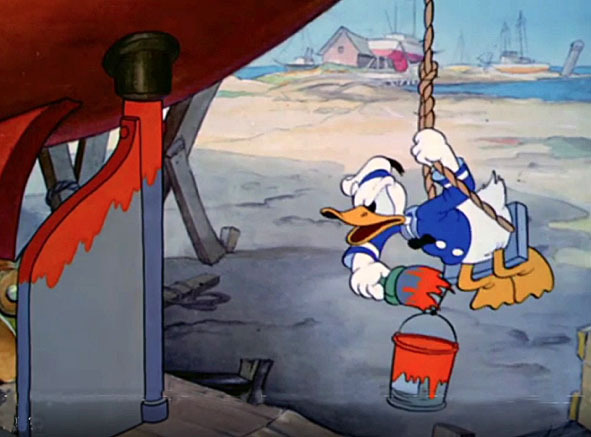 Once the crate is opened, Mickey shouts to Donald and Goofy to “lend a hand me hardies.” To which, the three characters begin pulling on a rope attached to the collapsed keel and rib assemble within the crate. All at once, the characters begin to jump and run out of the way as the keel and ribs pop out of the box like an uncoiled spring and unfold leaving the hapless trio dangling off of ribs near the stern. If only boat building were this easy! Much of this animation is done by Charles “Chuck” Couch, another lesser known animator, who had started at Disney in 1929 as an inbetweener. By 1932, Couch had moved up quickly to animator and Art Babbitt was his inbetweener. According to Studio records, Couch was noted to be “very inconsistent” in his animation. Couch moved into story working with Carl Barks on Donald Duck shorts and was credited with story on Bambi. He was laid off from Disney following the animation strike of 1941 and went on to work at MGM, Chuck Couch Associates and Hanna-Barbera. In all, Couch did about sixty-five feet of animation on Boat Builders. Mickey, Donald and Goofy continue building their boat including a telescoping mast and nailing wood planks to the frames. 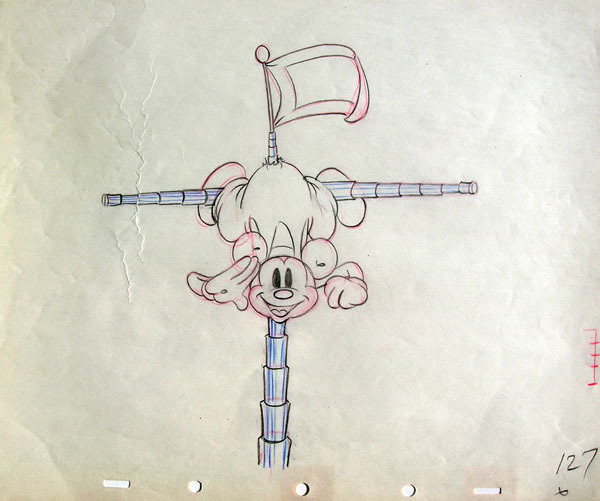 Much of the animation from Mickey extending the mast through Goofy wrapped around the bowsprit was animated by Eddie Strickland. He joined Disney at the Hyperion Studio in 1935 and appears to have left during the layoffs following the animation strike. Strickland’s animation credits include the notable shorts Mickey’s Service Station (1935), Elmer Elephant (1936), Little Hiawatha (1937) and Bill Posters (1940). In looking at the Boat Builders draft, Strickland produced approximately one hundred and forty feet of animation on this short. Animator Giles (Frenchy) de Trémaudan also did a lot of animation on this short as well. It is always nice to see animators given chunks of animation continuity—multiple scenes in a row that lets them show their skills and have some fun. Frenchy clearly did just that animating the section of Mickey installing the ship’s wheel while Donald is trying to paint the rudder. This is scene 17 through scene 26A ending with Donald with the paintbrush in his mouth, a ninety-seven foot sequence. It’s a wonderful comedic section especially of Donald tangling with the ship’s rudder, which is beautifully animated. From Donald with a paintbrush in his mouth the scene cuts to Goofy carrying in a crate, placing it down and then opening it to reveal a mermaid figurehead. The Goofy animation from this section of the cartoon on is done by Disney legend Clyde Geronimi; known as Gerry, which is how he is noted on the Disney scene draft. Geronimi joined Disney in 1931 as an animator on shorts. After WWII ended, he went on to direct on Cinderella (1950), Alice in Wonderland (1951), Peter Pan (1953), Lady and the Tramp (1955), Sleeping Beauty (1959), and One Hundred and One Dalmatians (1961). In my opinion, he displays solid animation and a great command of the Goofy character. His Goofy animation is stronger in poses and timing than that of Eddie Strickland’s in the earlier section of the cartoon where Goofy is nailing planks onto the ribs. Geronimi’s animation sequence ends with Goofy sitting on the ground in his red one piece and his clothes hanging on the anchor. 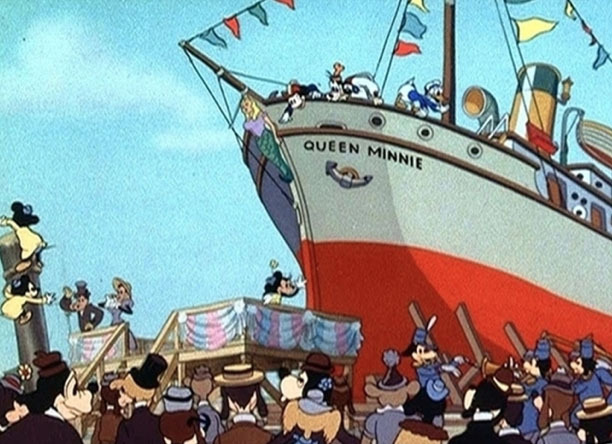 The scene cuts to Louie Schmitt’s animation of Minnie Mouse christening of the ship. The long shot of the ship starting to move, scene 56A, is by Paul Satterfield, an animator on shorts and a sequence director on Fantasia and Bambi. Then the scenes quick cut to various parts of the ship unfolding and deconstructing, in a terrific sequence animated by Don Patterson, an animator who worked at Disney from 1936 to 1946 and continued his career at MGM and Hanna-Barbera. 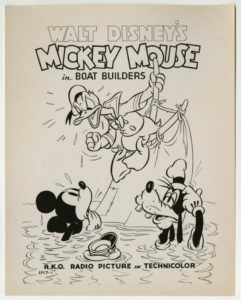 Patterson also animated the last scene in the short of Mickey, Donald and Goofy sitting on some debris after their ship sinks. “All you do is put it together,” said Mickey as he starts laughing. “Oh, phooey,” replies Donald as the cartoon irises out to black and THE END over the red burlap comes on. The short was directed by Disney legend Ben Sharpsteen and was released on February 28th, 1938. There was additional animation by Archie Robin, who animated at Disney from 1932 through 1939. He animated mostly on Mickey Mouse and Silly Symphony cartoons including the Academy Award winning The Ugly Duckling. Robin animated some of the Mickey scenes in Boat Builders. The decidedly nautical score is by Leigh Harline and Oliver Wallace. The score opens with a variation on the traditional Sea Chanty “Blow the Man Down,” which dates back to the 1860s and is in the public domain. The use of familiar public domain music was typical of early Disney animation. There were no licensing fees or other payments and it gave the composers familiar tunes to work with in constructing a score for these shorts. You can hear that familiarity in the music throughout Boat Builders. 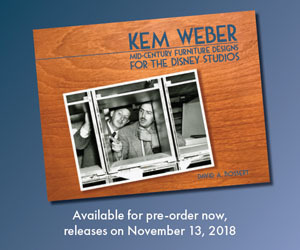 In watching this cartoon, I marveled at the fact that this group of lesser known animators, with maybe the exception of Geronimi and Frenchy, was assigned to work on this short while many of the more known Disney animators—Kimball, Moore, Kahl, Babbitt, Thomas, Tytla, Reitherman, etc.— were working on Snow White and the Seven Dwarfs. Walt clearly had his best animators and artists working on the feature, but he still had the obligation of supplying shorts, which was the bread and butter of the Studio up until that point. But, if you’re running a Studio operation and taking a big risk on an animated feature, which had never been done before, you have to put your best foot forward and use the best artists. At the same time, Walt had to keep the business going with the shorts. Ultimately, it did become an “all hands-on deck” situation to get Snow White finished. That has been typical in animation over the years when a film is in the last crushing months or animation production— everyone pitches in to get it done. Ben Sharpsteen, Louie Schmitt, and Don Patterson all worked on Snow White as well. I have no doubt from my own experiences, that most of the artists were thrown onto the project at some point just to help get it finished. Even for a few days or a week. It all boils down to not missing the release date, but also Walt had everything riding on this first animated feature. Even though Boat Builders was in production in September 1937, Snow White had a premiere date of December 21, 1937 and the final animation wasn’t completed until November 11th, ink and paint didn’t finish until November 27th and camera was not completed until December 1st. Talk about a nail-biter. The film started sneak previews six days later. There is no doubt that the ink and paint and the camera departments went right on to completing Boat Builders along with a myriad of other films that were in production. With all that going on at the Studio, it was a miracle that Boat Builders got done and released on February 25th, 1938. It is a gem of Mickey Mouse cartoon and one I enjoy watching especially during the summer before I head to Maine for a little sailing. Sure is! Notice Mickey’s ship is the Queen Minnie! I saw this on a Cartoon Classics back in the day alongside “Canine Caddy” (1941), one of the best golf-related shorts, and “Moose Hunters” (1937) (the latter recently saw on TCM’s Treasures from the Disney Vault). It’s great to hear about some of the lesser known Disney animators. Mostly we hear about the big stars – the Nine Old Men, Tytla, Babbitt, Moore – but there were dozens of others toiling away on the shorts and occasionally getting their chance to contribute on the features. Here’s to reading more about those unsung heroes. One day, my office door was open, and Chuck Couch happened to walk by. He suddenly stopped at my door, did a surprised take, and then he slowly began walking into my office toward me. I was perplexed. Chuck and I weren’t particularly close, and I couldn’t imagine why on earth he would be entering my office. His gaze went right past me to the image on the calendar. He stared at it closely for a long time, inspecting it very carefully, and then finally he muttered, “Yeah. I thought so. That drawing’s one of mine.” Then he turned and sauntered out without saying another word. What a great memory!! Thanks for sharing that. This was reissued in 2007 with the feature “Meet the Robinsons”.